STRONGER play in the gale force winds at the Bet Butler Stadium enabled SPFL Championship leaders to blow away the Dumbarton challenge. STRONGER play in the gale force winds at the Bet Butler Stadium enabled SPFL Championship leaders Hearts to blow away the Dumbarton challenge, in front of some 1,550 shivering spectators. The visitors were undeterred in facing the storm in the first half, and were soon two goals up through fine strikes by Sam Nicholson and Jamie Walker. Sons, who had been hoping to gain the advantage with the wind behind them came close on several occasions, twice hitting the bar. Mark Gilhaney broke through only to be foiled by keeper Neil Alexander, and Archie Campbell was just wide with a follow-up shot. Robbie Neilson's men continued to dominate after the break, showing just why they are the unbeaten league leaders. Within six minutes on loan Dutch star Género Zeefuik effectively wrapped up the game for the visitors with a close range effort. Nicholson netted his second goal on 56 minutes, and Zeefuik made it a brace on the hour. Sons struck back immediately through young St Johnstone striker Chris Kane, playing the last game of his second loan spell, with a strike from distance to the bottom left corner to make it 5-1. It could have been six for Hearts on 64 minutes, when Scott Linton fouled Jamie Walker in the penalty area. 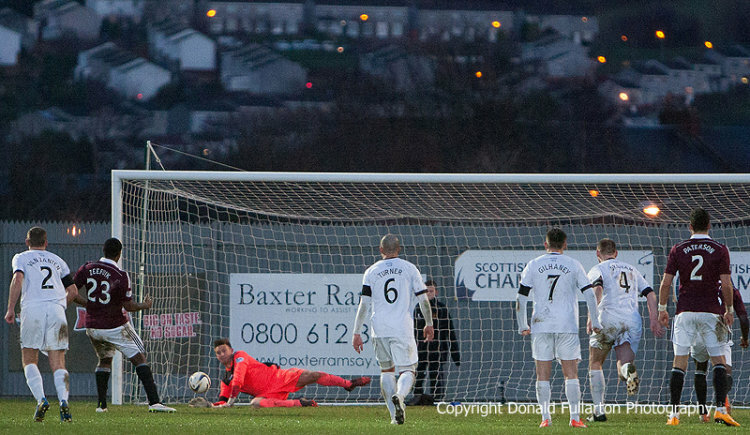 However Rogers denied Zeefuik his hat-trick with a good save from the spot-kick (pictured). Ian Murray's men tried hard for a second goal, but it was not to be. At the other end Rogers had more saves to make before the final whistle.